Cameron Jamie, Ex Harlequin, 2013. 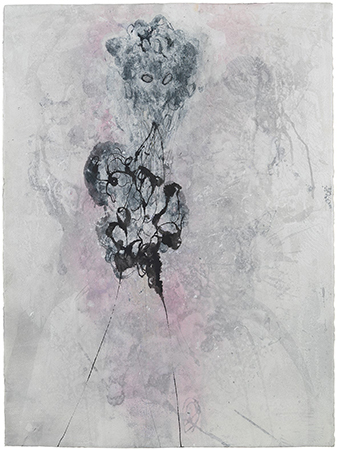 Ink and mixed media on paper, 84.5 x 65 x 4 cm. Courtesy the artist and Bernier/Eliades Gallery, Athens. The Drawing Prize’s jury has awarded the 2016 edition to Cameron Jamie, an American artist, born in 1969 in Los Angeles. Represented by the galleries Barbara Gladstone (Brussels and New York), Bernier-Eliades (Athens) and Buchholz (Cologne), he lives and works in Paris. The award ceremony took place in Paris at the Salon du Dessin on March 31. The winner received a prize of 15.000 EUR whilst the two other artists—Jana Gunstheimer and Anne-Marie Schneider—each received an endowment of 5.000 EUR. A work by the winner will be offered to a French institute by the Foundation. Closely linked to American culture, Cameron Jamie’s multiform work is a critique of modern society finding its source in the underprivileged suburbs of North American cities. Transforming the aesthetic codes of popular and underground culture, his very reactive drawings, as close to his emotions as possible, enable him to save and convey his energy as well as a certain tension. The drawings produced since the beginning of the 2000s have been extended into performances, films, photographs, installations and recently into ceramic sculptures. Cameron Jamie has been invited to take part in numerous exhibitions, notably at the Whitney Biennial; the Walker Art Center in Minneapolis, MN (retrospective in 2006); the Centre Pompidou, Paris; the Quai Branly Museum, Paris; and the last Biennale de Lyon. He is in the collections of the MNAM-Centre Pompidou and of Daniel & Florence Guerlain. Created in 1996, the Daniel & Florence Guerlain Contemporary Art Foundation organized exhibitions in the family property for ten years, before Daniel and Florence Guerlain decided in 2006 to devote the Foundation’s activities to the Contemporary Drawing Prize. First biennial then annual, the prize wishes to encourage and allow for the growth of contemporary drawing. Each year, it honours a winner from among the three artists selected by a committee composed of the two founders, Daniel and Florence Guerlain and of four members chosen for their competence and interest in contemporary art. The prize is reserved for French or foreign artists, living in France or not, but who entertain a privileged cultural link with France through institutional exhibitions and for whom drawing is a significant part of their work, whatever their main mode of expression might be (painting, sculpture, photography, etc.). The Prize honours artists who make any unique work on paper or cardboard, using graphic means: crayon, charcoal, red chalk, ink, wash tint, gouache, watercolour, pastels and felt…including collages and wall drawings but excluding computer and mechanical processes. The winner is chosen by a jury exclusively comprised of French and foreign collectors that is renewed each year. The 2016 jury: Nathalie Cohen (France), Jean-Luc Enguehard (France), Daniel and Florence Guerlain, José Olympio Pereira (Brazil), Michael Ringier (Switzerland), Daniel Schildge (France), Lorenza Sebasti Pallanti (Italy), and Budi Tek (China). Past winners: Silvia Bächli, Switzerland (2007); Sandra Vásquez de la Horra, Chile (2009); Catharina Van Eetvelde, Belgium (2010); Marcel Van Eeden, Netherlands (2011); Jorinde Voigt, Germany (2012); Susan Hefuna, Germany (2013); Tomasz Kowalski, Poland (2014); and Jockum Nordström, Sweden (2015). The Drawing Prize benefits from the generous support of the Cercle des Amis de la Fondation d’art contemporain Daniel & Florence Guerlain and from Neuflize OBC, Artcurial, Axa Art, Guerlain, Loticis – le Chêne vert and Voisin Consulting. Partners: The Salon du Dessin, Beaux-Arts de Paris, and Champagne Bruno Paillard.